The Dallas Cowboys, winners of the Super Bowl following the 1992 NFL season, were strong again in ’93 and posted a conference-best 12-4 record in topping the NFC East. Rebuilt into a championship team by Head Coach Jimmy Johnson, the Cowboys had an offense constructed around QB Troy Aikman (pictured at right), RB Emmitt Smith, and WR Michael Irvin. The defense set a club record by allowing just 21 touchdowns and featured DT Russell Maryland, MLB Ken Norton, CB Kevin Smith, and FS Thomas Everett. 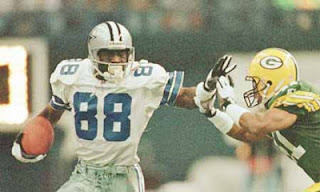 Dallas faced the Green Bay Packers in a NFC Divisional Playoff game on January 16, 1994 as they sought to defend their title. Green Bay was in the postseason for the second straight year under Head Coach Mike Holmgren, again posting a 9-7 record to finish third in the NFC Central but qualify for a Wild Card spot. In his second year as a starter, QB Brett Favre was still a work in progress who suffered with inconsistency (he was intercepted a league-leading 24 times) but was selected to the Pro Bowl. WR Sterling Sharpe caught 112 passes and TE Jackie Harris was a fine pass-catching tight end, but the running game was mediocre. The defense was anchored by All-Pro DE Reggie White and also contained pass rushing LB Bryce Paup and SS LeRoy Butler. The Packers defeated the division-rival Lions in the Wild Card round to advance to the Divisional playoff against the Cowboys. It was a mostly-cloudy day with 64,790 in attendance at Texas Stadium. The Packers got an apparent early break when Emmitt Smith, who was still recovering from a shoulder separation, fumbled after being hit by LB Tony Bennett and Butler recovered at the Dallas 43. But Green Bay gave the ball right back on the next play when Favre fumbled while being sacked by DE Tony Tolbert and DE Leon Lett recovered the ball for the Cowboys. The teams traded punts and, following a short series for Dallas, a fake punt on fourth-and-one failed to pick up the necessary yardage and Green Bay took over in Cowboys territory at the 28. This time the Packers got on the board but, after advancing 16 yards in seven plays, they had to settle for Chris Jacke kicking a 30-yard field goal. The Cowboys were driving as the opening period ended, but early in the second quarter Butler intercepted an Aikman pass. However, the Packers lost yardage in three plays and punted, and Dallas put together an eight-play, 68-yard scoring series. Aikman completed four passes, the last to WR Alvin Harper for a 25-yard touchdown. Ed Murray added the point after and it was 7-3. The Packers started off their next possession from deep in their own territory when CB Corey Harris fumbled the ball out of bounds at the four on the kickoff return. However, following a short run on first down, Favre threw to TE Darryl Ingram for seven yards and then hit Sterling Sharpe for a 48-yard gain to the Dallas 39. Green Bay advanced to the 31, from where Jacke’s 49-yard field goal try was unsuccessful when it hit the right upright. The Cowboys came back with a 10-play, 45-yard series. Aikman had completions to Smith for 22 yards and to Irvin for 11 and 13 yards before the drive stalled at the Green Bay 23. Murray made good on a 41-yard field goal attempt that made it 10-3 with 28 seconds remaining in the half. The scoring wasn’t over, however, as Harris again lost the ball when stripped by DB Kenneth Gant on the kickoff return and safety Joe Fishback recovered the fumble for Dallas at the Green Bay 15. Aikman threw to Irvin for eight yards and then to TE Jay Novacek for six yards and a TD. The Cowboys went into halftime with an enhanced 17-3 lead. The Packers had the first possession in the third quarter and punted, but got a break on defense when CB Terrell Buckley intercepted an Aikman pass at the Green Bay 40. Favre quickly passed them into Dallas territory and RB Darrell Thompson gained 12 yards on two carries, but the drive stalled at the 37. The Packers attempted to convert a fourth-and-eight situation, but Favre’s completion to TE Ed West gained only six yards. The Cowboys made the most of the reprieve and went 69 yards in six plays. An 18-yard Aikman-to-Irvin completion had another 15 yards tacked on due to a face mask penalty and Aikman connected with Irvin again with a well-thrown pass to the back of the end zone for a 19-yard touchdown. Down 24-10, the Packers came back with a scoring drive of their own. Favre completed four straight passes after facing a third-and-six situation at his own 22, the longest to Thompson for 30 yards. The nine-play, 82-yard series ended with Favre throwing to WR Robert Brooks for a 13-yard TD. With the extra point added, it was a 14-point game with just over a quarter remaining. Following a punt by the Cowboys early in the final period that was returned 43 yards by Brooks, Favre was immediately picked off by DE Charles Haley after his pass was deflected by DE Jim Jeffcoat. Dallas moved down the field, going 47 yards in 9 plays, highlighted by a nine-yard Aikman completion to Novacek on a third-and-six play and another throw to Irvin that picked up 27 yards. The Packers stiffened and, on a third down play at the Green Bay 15, Aikman was sacked by Bryce Paup. However, Murray added a 38-yard field goal and the Cowboys had managed to run 5:33 off the clock. With Favre throwing on every play, the Packers drove from their own 15 to the Dallas 15. But the thirteenth play of the possession ended with SS Darren Woodson intercepting a pass at the five to essentially nail down the win. Green Bay scored a touchdown in the last two minutes as Favre threw to Sharpe from 29 yards out, but it was a case of too little, too late. Dallas won by a score of 27-17. The Cowboys had the edge in total yards (381 to 358) and first downs (23 to 19). Neither team gained much on the ground (97 yards on 27 attempts for Dallas, 31 yards on 13 carries for Green Bay) and the Packers sacked Aikman four times, to just two sacks of Favre. However, the Packers also turned the ball over on four occasions, to three by Dallas, and the Cowboys took better advantage of their breaks. 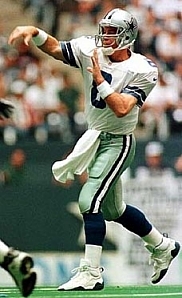 Troy Aikman completed 28 of 37 passes for 302 yards with three touchdowns against two interceptions. Michael Irvin (pictured above) led the Dallas receivers with 9 catches for 126 yards and a TD. Emmitt Smith gained 60 yards on 13 rushing attempts. 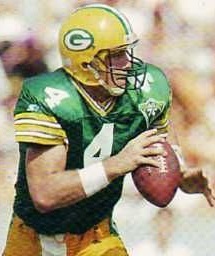 For the Packers, Brett Favre (pictured below) was successful on 28 of 45 throws, going 20 of 34 in the second half alone, for 331 yards with two touchdowns and two interceptions. RB Edgar Bennett, who gained just three yards on six carries, led the receivers with 9 catches for 53 yards while Sterling Sharpe gained 128 yards on his 6 receptions and scored a touchdown. Darrell Thompson was the leading rusher with 28 yards on 7 attempts. The Cowboys went on to defeat the 49ers for the NFC title for the second straight year and then won the Super Bowl over the Buffalo Bills, also for the second year in succession. Jimmy Johnson left as head coach, to be succeeded by Barry Switzer, and while Dallas put together another 12-4 record in 1994, the club fell short in the NFC title game. The Packers were 9-7 for the third straight year in ’94, again qualifying for the postseason as a Wild Card and falling once again to the Cowboys at the Division level. Things would change regarding the relative status of the two teams later in the decade, particularly as Brett Favre improved, but at this point Dallas was the superior club.